Toronto ​Bad Dog Theatre's unscripted comedy show inspired by Star Trek and guided by audience suggestion. Improv in space! Bad Dog Theatre's Final Frontier will include familiar favorites from one of the best loved TV shows of all times, with the fresh originality of unscripted comedy. The show will follow the adventures of an all new ship and crew, facing a unique set of discoveries and dangers, created live at every performance. With all of the adventure, action and imagination of Star Trek, Final Frontier will aspire to create a universe that is just as intricate and breathtaking as the original Emmy and Hugo Award-winning series. 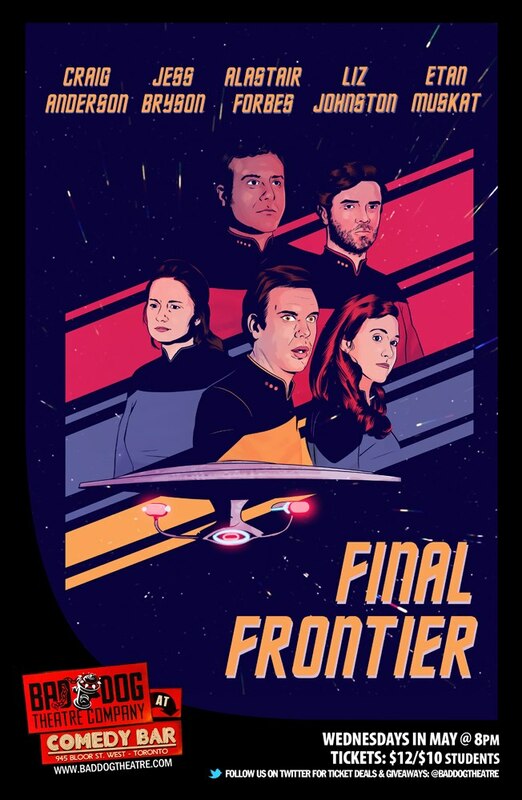 Directed by acclaimed improvisor Etan Muskat and featuring a fantastic crew of renowned comedic performers, Final Frontier encourages the audience to participate and affect the outcome of the crew's adventures, ultimately deciding where they will boldly go! Performers include: Etan Muskat (The Bitter End), Jess Bryson (Vancouver Theatresports League), Liz Johnston (Hawkins), Alastair Forbes (Second City Mainstage), Craig Anderson (The Sunday Service). or by the Comedy Bar Box Office at 416-551-6540.